A pair of rabbit-themed reissues are back just in time to serve as basket treats. 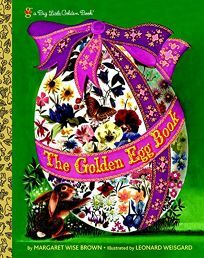 The 1947 classic The Golden Egg Book by Margaret Wise Brown, illus. by Leonard Weisgard, returns as a Big Little Golden Book. When a curious bunny finds a blue speckled egg, he tries everything from jumping on it to pelting it with rocks and acorns to find out what's inside. But since a watched egg never cracks, the mystery occupant only emerges at last when the bunny falls asleep. The soft, retro illustrations ably depict the animals' feisty youthful impatience and curiosity.